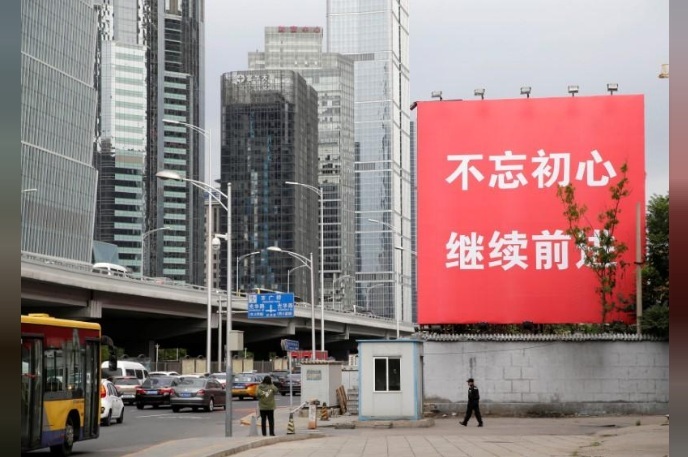 A security guard walks under a banner reading "Stay true to the mission, continue to move foward" in Beijing's central business area, as the capital prepares for the 19th National Congress of the Communist Party of China, October 14, 2017. BEIJING - China’s official Xinhua news agency attacked Western democracy as divisive and confrontational on Tuesday, praising on the eve of a key Communist Party Congress the harmony and cooperative nature of the Chinese system. China’s official Xinhua news agency attacked Western democracy as divisive and confrontational on Tuesday, praising on the eve of a key Communist Party Congress the harmony and cooperative nature of the Chinese system.